September in Cambridge belongs to the ordinary people who live and work there. The students do not arrive until October and most of the visitors have left. This is the time the Cambridge News and Cambridge Building Society organise the annual 'Bridge the Gap Walk', a five mile charity walk through the historic grounds of some of the central Colleges. Money raised goes to the Arthur Rank Hospice and other good causes. 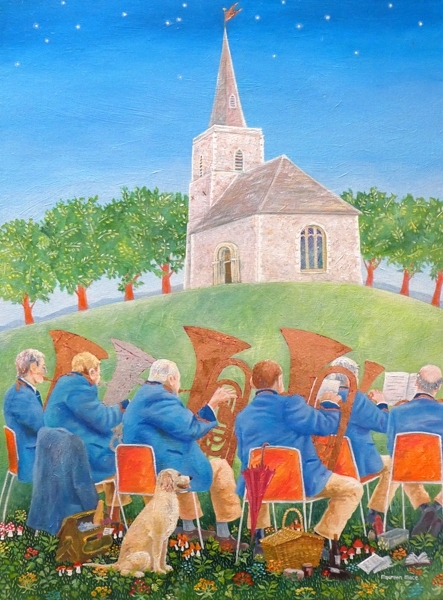 This painting is of the Waterbeach Brass Band who travel every year from their village 6 miles to the north of Cambridge to play at Emmanuel College. Never content to paint people where I see them I have transported them to St Peter's Church, a pretty little building next to Kettles Yard ......and they have just finished their packed lunches and taken the dog for a walk. Can you hear their music?